I have been getting a lot of requests for information as to the proper care and cooking of ribs. Ribs must be Americas favorite barbecue dish. I lost my taste for ribs in 1985 when I went to Cleveland, Ohio with Cuzin Homers Barbecue Team. For three days I had all the ribs I could consume and that was a considerable amount. Since then, ribs have not been so enchanting to me. But, AMERICA (and maybe several foreign countries) WANTS TO KNOW! So here we go. When we speak of ribs, most of us are thinking pork ribs, though in some areas beef ribs are in favor. We will stick with pork ribs for this occasion. There are three basic types of ribs. First are the spare ribs. The spare ribs come from the underbelly and side of the pig. They contain the least amount of meat on the bone. Next are the back ribs. They are from the blade and center section of the loin. They have more meat per amount of bone than the spare ribs. Country-style ribs come from the rib end of the loin and contain the most meat per bone. When you are trying to decide how many ribs to buy, you can figure that the spare ribs will produce one and a quarter servings per pound, raw weight. The back ribs will give one and a half servings per pound and the country style come in at two servings per pound. The spare ribs and the back ribs seem to turn out better if they are grilled, rather than slow smoked. You put them over medium heat, and they should be done in an hour and a half to two hours. However, since country-style ribs have a much thicker layer of meat and require a longer cooking time, they benefit from slow smoking. In any case, give the ribs a good coating of dry rub and let them set in a plastic bag several hours or overnight in the icebox to let the seasoning work in. Put the spare ribs and the back ribs on the grill -- bone side down to start. Turn several times during the cooking time and give a mopping with a good mop sauce. Just before they are done, you can use your finishing sauce. [Note: See Barbecue 101 for Basic Mop Sauce and Basic Finishing Sauce recipes.] You can test for doneness by grasping one of the bones with glove or tongs and giving it a wiggle. When the meat turns loose from the bone, they are done. Cuzin Homer hit on the idea of parboiling the ribs. Back to Cleveland, Ohio in 1985. The Cuzin Homer BBQ Team had not previously cooked ribs in the volume that was required for the National Rib Burn-Off, which was a commercial cookoff where the contestants sold their product to the public. We knew we would need to be able to cook a lot of ribs in very little time. Cuzin Homer hit on the idea of parboiling the ribs. For our trial run before the cookoff, we had a very large pot constructed along with a suitable propane burner. Into the pot went water that we seasoned with garlic powder, onion powder and black pepper. When the seasoned water came to a strong boil, in went the slabs of ribs. When the ribs just began to turn loose from the bone, we fished them out and put them on the grill and applied the finishing sauce. In a few minutes, the ribs were done and mighty tasty due to the seasoning being boiled in. At Cleveland, we would boil up several cases of ribs at a time and then put them in cold storage until we were ready to grill them. The time saved really was important when you consider that we cooked over 3000 slabs of ribs that weekend. So, you might want to try parboiling some ribs just to see how they compare to your all-grilled variety. To really "tender up" your at home ribs, when they are done, wrap them tightly in foil and place the package in a brown paper bag and let it set for an hour. The steaming will really tender the ribs up. It is also helpful when you get the ribs done a little ahead of the rest of the meal. You can probably leave them in the wrapping longer than an hour without hurting the quality. 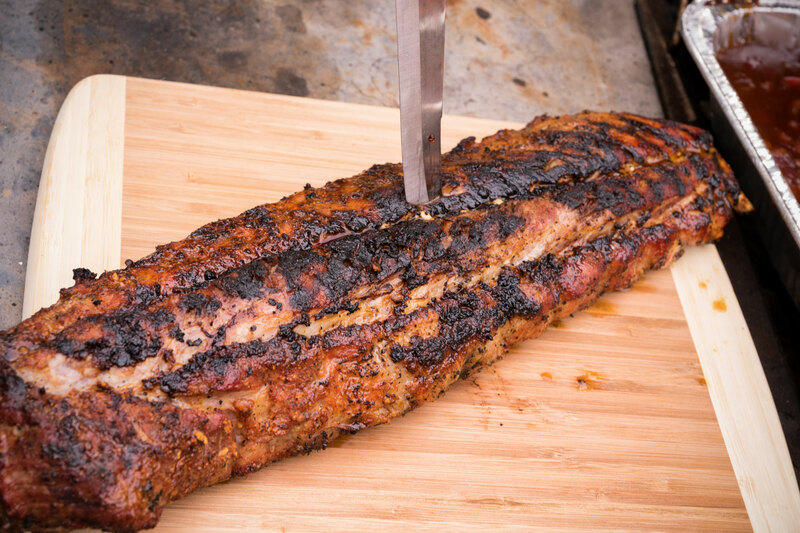 Rub with lots of black pepper and finish with jalapeno flavor sauce. Rub containing garlic and onion powder, white pepper, seasoned pepper, chili powder, cumin, brown sugar and paprika. (Could be hot with all the peppers.) Mop with apple cider. Rub contains, paprika, garlic powder, seasoned salt, dry mustard, oregano and chili powder. Finishing sauce, mild with molasses and bourbon. Rub contains, 5-spice powder, black pepper. Baste contains, hoisin sauce, honey, sherry, soy sauce, gingerroot and garlic. A favorite in New Mexico/Arizona. A good chili seasoning mix is mixed with a little vinegar and oil to make a paste that covers the ribs during the cooking process. Smells wonderful while cooking. The cooking of ribs need not be confined to the grill or smoker. They can be prepared in the kitchen with finger licking results. In my family, fried spare ribs were a favorite. Mama would cut the ribs into pairs and season with salt and pepper, dredge with flour and fry in hot grease until crispy on the edges. Mama would also bake spare ribs in the oven. Just seasoned and floured and baked. They were a little greasy, but in those days grease wasnt bad for you. I like to do country-style ribs up like a pot roast. I season the ribs with seasoned salt. Then they get a coating of flour and are browned on all sides in a heavy skillet with a tight-fitting lid. When the ribs are brown on all sides, I pour off the excess grease and add my vegetables. First, on goes a green bell pepper, seeded and sliced. Next a big onion sliced and broken into rings, then a potato or two, white or sweet potato or some of each, several sliced carrots. Any other vegetables on hand are candidates for the skillet. I like to finish off the load with some sliced cabbage. Keep the skillet over medium heat until it begins to steam. Cover tightly and turn the heat down until you just get a simmer. Let it cook three or four hours. When the carrots are tender, the meat is done, but the longer you let it cook, the better it gets. If you have to add water, your heat is too high. The vegetables alone will make enough moisture for a fine gravy. Pass me another napkin or two, would you?